There is increasing evidence that using frequent invasive measures of pressure in patients with heart failure results in improved outcomes compared to traditional measures. Admittance, a measure of volume derived from preexisting defibrillation leads, is proposed as a new technique to monitor cardiac hemodynamics in patients with an implantable defibrillator. The purpose of this study was to evaluate the accuracy of a new ventricular volume sensor (VVS, CardioVol) compared with 3-dimenssional echocardiography (echo) in patients with an implantable defibrillator. Twenty-two patients referred for generator replacement had their defibrillation lead attached to VVS to determine the level of agreement to a volume measurement standard (echo). Two opposite hemodynamic challenges were sequentially applied to the heart (overdrive pacing and dobutamine administration) to determine whether real changes in hemodynamics could be reliably and repeatedly assessed with VVS. Equivalence of end-diastolic volume (EDV) and stroke volume (SV) determined by both methods was also assessed. EDV and SV were compared using VVS and echo. VVS tracked expected physiologic trends. EDV was modulated −10% by overdrive pacing (14 mL). SV was modulated −13.7% during overdrive pacing (–6 mL) and increased over baseline +14.6% (+8 mL) with dobutamine. VVS and echo mean EDVs were found statistically equivalent, with margin of equivalence 13.8 mL (P <.05). Likewise, mean SVs were found statistically equivalent with margin of equivalence 15.8 mL (P <.05). VVS provides an accurate method for ventricular volume assessment using chronically implanted defibrillator leads and is statistically equivalent to echo determination of mean EDV and SV. This entry was posted in Research on January 12, 2018 by Admittance Technologies. Conductance catheters are known to have a nonuniform spatial sensitivity due to the distribution of the electric field. The Geselowitz relation is applied to murine and multi-segment conductance catheters using finite element models to determine the spatial sensitivity in a uniform medium and simplified left ventricle models. A new formulation is proposed that allows determination of the spatial sensitivity to admittance. Analysis of FEM numerical modeling results using the Geselowitz relation provides a true measure of parallel conductance in simplified left ventricle models for assessment of the admittance method and hypertonic saline techniques. The spatial sensitivity of blood conductance (Gb) is determined throughout the cardiac cycle. Gb is converted to volume using Wei’s equation to determine if the presence of myocardium alters the nonlinear relationship through changes to the electric field. Results show that muscle conductance (Gm) from the admittance method matches results from the Geselowitz relation, and that the relationship between Gb and volume is accurately fit using Wei’s equation. Single-segment admittance measurements in large animals result in a more evenly distributed sensitivity to the LV blood pool. The hypertonic saline method overestimates parallel conductance throughout the cardiac cycle in both murine and multi-segment conductance catheters. This entry was posted in Research on April 8, 2013 by Admittance Technologies. Introduction: ICDs monitor intracardiac EGMs and respond to detected arrhythmias through either observation, anti-tachycardia pacing (ATP), or through the delivery of a shock. However, inappropriate shocks are delivered to one third of patients within the first 1-3 years. Coupling EGMs with an assessment of LV Stroke Volume (SV) would be of value to discriminate between hemodynamically stable and unstable arrhythmias. We propose the use of admittance Y, the inverse of complex impedance Z, measured using biventricular (Bi-V) pacing leads as a new method to monitor LV SV. This entry was posted in Research on May 24, 2012 by Admittance Technologies. Abstract: There are two implanted heart failure warning systems incorporated into biventricular pacemakers/automatic implantable cardiac defibrillators and tested in clinical trials: right heart pressures, and lung conductance measurements. However, both warning systems postdate measures of the earliest indicator of impending heart failure: left ventricular (LV) volume. There are currently no proposed implanted technologies that can perform LV blood volume measurements in humans. We propose to solve this problem by incorporating an admittance measurement system onto currently deployed biventricular and automatic implantable cardiac defibrillator leads. 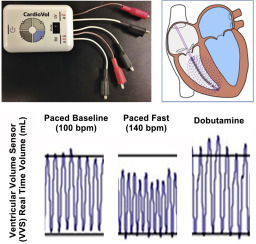 This study will demonstrate that an admittance measurement system can detect LV blood conductance from the epicardial position, despite the current generating and sensing electrodes being in constant motion with the heart, and with dynamic removal of the myocardial component of the returning voltage signal. Specifically, in 11 pigs, it will be demonstrated that 1) a physiological LV blood conductance signal can be derived; 2) LV dilation in response to dose-response intravenous neosynephrine can be detected by blood conductance in a similar fashion to the standard of endocardial crystals when admittance is used, but not when only traditional conductance is used; 3) the physiological impact of acute left anterior descending coronary artery occlusion and resultant LV dilation can be detected by blood conductance, before the anticipated secondary rise in right ventricular systolic pressure; and 4) a pleural effusion simulated by placing saline outside the pericardium does not serve as a source of artifact for blood conductance measurements. This entry was posted in Research on December 9, 2010 by Admittance Technologies. Abstract: The conductance catheter technique could be improved by determining instantaneous parallel conductance (GP), which is known to be time varying, and by including a time-varying calibration factor in Baan’s equation [(t)]. We have recently proposed solutions to the problems of both timevarying GP and time-varying , which we term “admittance” and “Wei’s equation,” respectively. We validate both our solutions in mice, compared with the currently accepted methods of hypertonic saline (HS) to determine GP and Baan’s equation calibrated with both stroke volume (SV) and cuvette. We performed simultaneous echocardiography in closed-chest mice (n  8) as a reference for left ventricular (LV) volume and demonstrate that an off-center position for the miniaturized pressure-volume (PV) catheter in the LV generates end-systolic and diastolic volumes calculated by admittance with less error (P  0.03) (2.49  15.33 l error) compared with those same parameters calculated by SV calibrated conductance (35.89  73.22 l error) and by cuvette calibrated conductance (7.53  16.23 l ES and 29.10  31.53 l ED error). To utilize the admittance approach, myocardial permittivity (εm) and conductivity (m) were calculated in additional mice (n  7), and those results are used in this calculation. In aortic banded mice (n  6), increased myocardial permittivity was measured (11,844  2,700 control, 21,267  8,005 banded, P  0.05), demonstrating that muscle properties vary with disease state. Volume error calculated with respect to echo did not significantly change in aortic banded mice (6.74  13.06 l, P  not significant). Increased inotropy in response to intravenous dobutamine was detected with greater sensitivity with the admittance technique compared with traditional conductance [4.9  1.4 to 12.5  6.6 mmHg/l Wei’s equation (P  0.05), 3.3  1.2 to 8.8  5.1 mmHg/l using Baan’s equation (P  not significant)]. New theory and method for instantaneous GP removal, as well as application of Wei’s equation, are presented and validated in vivo in mice. We conclude that, for closed-chest mice, admittance (dynamic GP) and Wei’s equation (dynamic ) provide more accurate volumes than traditional conductance, are more sensitive to inotropic changes, eliminate the need for hypertonic saline, and can be accurately extended to aortic banded mice. This entry was posted in Research on August 20, 2009 by Admittance Technologies. Abstract: A large animal finite element model for a multi-electrode conductance catheter is presented for use in the right ventricle. The concept of conductance measurement for the determination of blood pool volume is explained, and the nonlinearity of the volume response function is determined for a commercially available conductance catheter. The effect of unused electrodes made in a tetrapolar measurement using the catheter is shown. This entry was posted in Research on December 31, 2008 by Admittance Technologies.